Clinical screening tool for meniscal tears. The Thessaly test is a dynamic reproduction of joint loading in the knee. Patients with suspected meniscal tears experience medial or lateral joint-line discomfort and may have a sense of locking or catching. 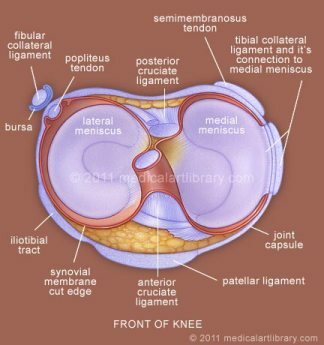 The theory behind the test is that, with this maneuver, the knee with a meniscal tear is subjected to excessive loading conditions and almost certainly will have the same symptoms that the patient reported. The test is performed at 5° and 20° of flexion. The examiner supports the patient by holding his or her outstretched hands while the patient stands flatfooted on the floor. The patient then rotates his or her knee and body, internally and externally, three times, keeping the knee in slight fiexion (5°). The same procedure is then carried out with the knee flexed at 20°. The test is always performed first on the normal knee so that the patient may be trained, especially with regard to how to keep the knee in 5° and then in 20° of flexion. In more recent studies  from 2015, the Thessaly test has been found to be no better then other tests such as the McMurray test and the Apley's Test. Karachalios T, Hantes M, Zibis AH, Zachos V, Karantanas AH, Malizos KN. Diagnostic accuracy of a new clinical test (the Thessaly test) for early detection of meniscal tears. J Bone Joint Surg Am. 2005;87(5):955-962. BACKGROUND: Clinical tests used for the detection of meniscal tears in the knee do not present acceptable diagnostic sensitivity and specificity values. Diagnostic accuracy is improved by arthroscopic evaluation or magnetic resonance imaging studies. The objective of this study was to evaluate the diagnostic accuracy of a new dynamic clinical examination test for the detection of meniscal tears. METHODS: Two hundred and thirteen symptomatic patients with knee injuries who were examined clinically, had magnetic resonance imaging studies performed, and underwent arthroscopic surgery and 197 asymptomatic volunteers who were examined clinically and had magnetic resonance imaging studies done of their normal knees were included in this study. For clinical examination, the medial and lateral joint-line tenderness test, the McMurray test, the Apley compression and distraction test, the Thessaly test at 5 degrees of knee flexion, and the Thessaly test at 20 degrees of knee flexion were used. For all clinical tests, the sensitivity, specificity, false-positive, false-negative, and diagnostic accuracy rates were calculated and compared with the arthroscopic and magnetic resonance imaging data for the test subjects and the magnetic resonance imaging data for the control population. RESULTS: The Thessaly test at 20 degrees of knee flexion had a high diagnostic accuracy rate of 94% in the detection of tears of the medial meniscus and 96% in the detection of tears of the lateral meniscus, and it had a low rate of false-positive and false-negative recordings. Other traditional clinical examination tests, with the exception of joint-line tenderness, which presented a diagnostic accuracy rate of 89% in the detection of lateral meniscal tears, showed inferior rates. CONCLUSIONS: The Thessaly test at 20 degrees of knee flexion can be used effectively as a first-line clinical screening test for meniscal tears, reducing the need for and the cost of modern magnetic resonance imaging methods. ↑ 1.0 1.1 1.2 Karachalios T, Hantes M, Zibis AH, Zachos V, Karantanas AH, Malizos KN. Diagnostic accuracy of a new clinical test (the Thessaly test) for early detection of meniscal tears. J Bone Joint Surg Am. 2005;87(5):955-962. ↑ Goossens P, Keijsers E, Van Geenen RJ, Zijta A, Van den Broek M, Verhagen AP, Scholten-Peeters GG. Validity of the Thessaly test in evaluating meniscal tears compared with arthroscopy: a diagnostic accuracy study. journal of orthopaedic & sports physical therapy. 2015 Jan;45(1):18-24. ↑ Snoeker BA, Lindeboom R, Zwinderman AH, Vincken PW, Jansen JA, Lucas C. Detecting Meniscal Tears in Primary Care: Reproducibility and Accuracy of 2 Weight-Bearing Tests and 1 Non–Weight-Bearing Test. The Journal of orthopaedic and sports physical therapy. 2015 Sep 1;45(9):693-702. ↑ Blyth M, Anthony I, Francq B, Brooksbank K, Downie P, Powell A, Jones B, MacLean A, McConnachie A, Norrie J. Diagnostic accuracy of the Thessaly test, standardised clinical history and other clinical examination tests (Apley's, McMurray's and joint line tenderness) for meniscal tears in comparison with magnetic resonance imaging diagnosis. Health Technology Assessment. 2015.